I never grew up with horses, and never learned personally what the love of a horse feels like. But I am certain that I am among many who are in awe of their breathtaking beauty, their absolute regality and their sheer equine power, the irony in which their powerful hooves both scorch the earth they ride upon, yet touch that same earth so gently they must be floating. 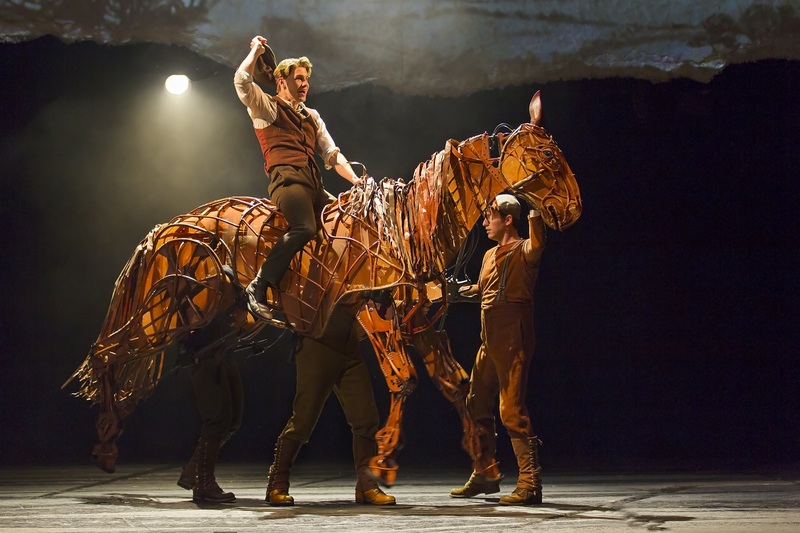 It does not take long for Albert Narracott, the principal character of the stunningly enchanting production of “War Horse,” now playing at San Francisco’s Curran Theatre, to understand this. Albert, portrayed handsomely and smartly by Andrew Veenstra, has a lot to overcome. Living in the British county of Devon, Albert’s liquor-swilling father Ted (an unflinching and unsympathetic turn by Todd Cerveris) buys his son a colt. Unfortunately, the bidding for the horse got out of control, and forced father into a price that rivals the payment for his farm, money which is hard to come by. A series of foolish decisions from the father have dire consequences for Joey, causing an absurd amount of stress for the 16-year-old Albert and his embattled mother Rose (warmly portrayed by Angela Reed). And in one final show of desperation, Ted sells Joey, now a grown stallion, to the military, which places the gorgeous horse on the front lines of World War I.
Albert can only hope to see Joey soon, considering he cannot join the military because of his age. He is such a righteous young man that he cannot even lie to keep Joey out of harm’s way. Of course, the lies start a bit later in order for Albert to join the Cavalry with the hopes of reuniting with Joey. The show is an absolute marvel of creativity, and pushes the bounds of what stage tableaus, at their best, can be. Quite simply, scenic designer Rae Smith has created a stage full of simple colors with which the action of the story melded flawlessly. Flanked by Smith’s stunningly shaped video screen that subtly dropped establishing images the entire length of the proscenium, the color palate of the show was very much ripe with earth tones. Smith makes all the right moves with her set design, relying so much on lighting designer Paule Constable’s small pools of light in certain scenes. The lighting mixed well with an endless stream of stage fog that created wonderfully harmonious locales. Like a bride wearing white on her wedding day, Joey, with his rich burnt orange color, was the bride of the proceedings, he being the focus of the show both literally and metaphorically. Puppets have long been a fascinating device that helps tell a story, and the puppets and puppeteers involved with “War Horse” have basically shaped the strongest aspects of this show. What is so wonderful is how well the puppeteers work is delicately nuanced. From the slight blowing of the horses tail or even the slightest ear twinkles while Joey drinks water, the puppets were a marvel. Even a very funny goose that runs around the stage and creates some serious gander consternation is terribly original. The puppets are what make the show soar. Constructed originally by South Africa’s Handspring Puppet Company, designers Adrian Kohler and Basil Jones, have cleverly created a puppet unlike anything you would ever see. The horse’s eyes are piercing, the body rich with genteel power. Horse choreographer Toby Sedgwick relies on simple movements to shape all of the horses, as well as bigger and more powerful motion to capture the tension and truth of each scene. The only downside to the show was that I wasn’t always able to understand the phrasing of some performers. The accents are quite thick, and unfortunately, I missed some of the dialogue. And even though the plot follows a common formula of loss and gain (it is, after all, based on Michael Morpurgo’s children’s book of the same name), it is not about the plot’s simplicity, but about the compelling nature of the play’s harrowing journey. There are so many layers to the show it is hard to narrow down the ones I found the most interesting. It was positively heart-wrenching to see a helpless animal in a hopeless battle with barbed wire, a huge, driving component of the drama. And yet, the victory of the stage creation is that the audience is tortured to watch this horse, an animal we have invested so much of our emotions in, fight for his life. In this way, these puppets are truly transcendent. The most important fact made by the play is that these horses are loaded with humanity. They sit on a battlefield, they try to escape bullets, they hurt for their masters, and they hurt for themselves, just like every soldier who occupied a bunker. They were more than animals to these brave men and women, they were comrades. It is estimated that in World War I, one million horses helped in the effort, yet only 62,000 survived. These are surreal numbers. The victory of “War Horse” is that there are resplendent images and elegant statements that speak to the love and care within ourselves. We as the audience live vicariously through every soldier and every caretaker who has the ability to stroke a forelock on the stage. “War Horse” is so powerful because it shatters the barriers of creativity and the human condition. We love animals, we love the way we feel about them and we are devastated when our ideal is tampered with. And whether it happens or not, we need to believe that a boy, who defies his own righteousness and lies to join the cavalry with the sole purpose of taking his horse home, will indeed find that horse someday. His own goodness depends on it. The word: The harrowing journey of a horse in World War I is told with passion and splendor in this epic production.